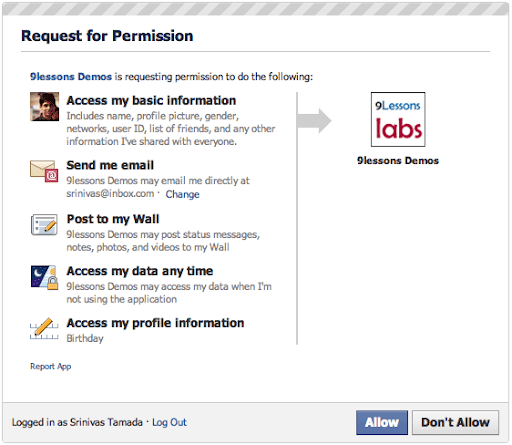 Working with Facebook SDK Permissions. Facebook is the new Web planet, nowadays it’s a part of human life. Facebook offering user data access via Graph API. This is very helpful for start-up web projects to quickly collecting people data. This post explains you how to request Facebook login, permissions,reading user data and updating Wall using Facebook SDK. Tutorial contains multiple demos try all these Thanks!. The tutorial contains lib directory contains facebook sdk and database config files with PHP files. Sample database users table columns id,facebook_id, name, email etc..
Parsing Facebook user details $userdata array values and inserting into users table. // Update or Post Facebook wall. Update Facebook Wall using access_token via Graph API. Log in scope should be status_update take a look at the Post to my Wall code. Facebook log in scope for updating Facebook wall. Note: Above cases access_token value not static, it's depends on Facebook login session. Here access_token is static, you can store this into users table. Any time you can do access or update Facebook using this access_token key. But facebook log out would't support so that you have to build native log out system for clearing sessions values as $userdata. Here any time you can update the Facebook wall. Just notice Access my data any time in following screen shot. 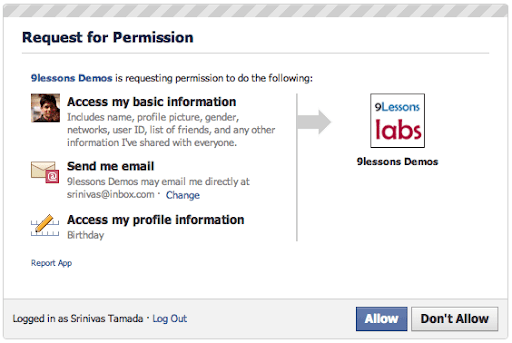 9lessons labs is offline access. Here I have requested full available scope to Facebook, based on your web project requirement you can select the user permission values. For more information about Facebook permissons read this link. Native log out sessions destroy. Awesome Script!!! Thank you so much. Thank You! Really helpful tutorial. You have shown how to get data like name, birthday etc. but how can I also retrieve information about school (name, year etc.) and other items that are in array ? Exactly what I was looking for. Can you do the same for the Google+ social network? Thanks for your Script (-: One Question. How can i update my Status when i logout or will post 2 days later? I have all Data in my Database. - seems to give me an error, any ideas? It says "Fatal error: Cannot use object of type Facebook as array"
Great job! Thaks to autors. Exelent! what u mean by this email and birth day filed..
how can i do this with canvas? 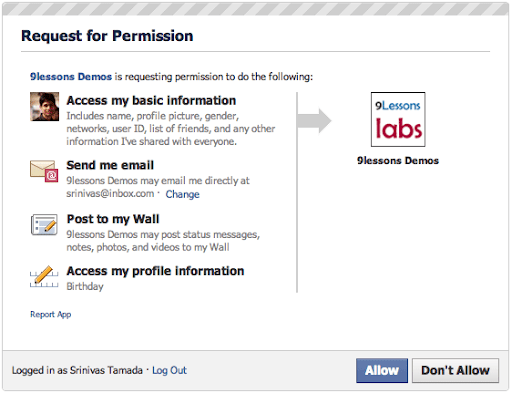 Working with Facebook SDK Permissions. I can't logout account. What can i do??????????????? getting error while creating facebook application...cant verify your account...what does it mean..? ?..how do i solve???? This worked really well for tracking individual logins! I'd like to use this to set up accounts for users and include other values, like game points. Should I simply get rid of the auto-incrementing ID, or will I still run into trouble with the SQL tables? Thanks!! i have a solution for your headers already send problem... you have whitespace before the in your PHP code. I struggled with this for several hours. Fix fblogin.php first. I want to access all the contacts detail of my friends from my gmail account just by giving an email id and password using PHP and JQuery..
hi , i am subscribed member of u r emails. i want to ask how to post user activity of our site to their facebook profile. "An error occurred with Pawan. Please try again later." hello srinivash. I like this article. but will it be totally secure to login through facebook? because now a days there are many hacking attacks happening in facebook. Hey dude.. Its superlike script for facebook permission... But I am little bit confuse about how to get friends email id's.... Is it possible?? can you help me, how to create NOTEs using Facebook SDK ? I can read note written by my friend, and with public setting. but I can't read from non-friend or private setting, right? I just found this error when using Google Chrome, but if I use Firefox, my facebook app running normally and no error appear. How to delete a status ? why, after complete login into facebook, fblogin.php not redirect into home.php? It works for me but it returns nothing and it does't redirect to home.php. Quick question, in "access my data anytime" mode... how do I then display the users info (specifically FB pic) throughout my website? how can i get tzhe user likes? for example -> all music likes. An error occurred with esprit. Please try again later. Try with registered live URL. Localhost it will not work. Can you help me, how we get friend list using Facebook SDK ? i want that facebook login page should be open in popwindow. I some one can help me . .. . ? Hello, can someone pls provide a code with a popup windows for login instead opening in the same window? can u pls modifiy this? he webpage at https://www.facebook.com/dialog/oauth?client_id=177639729007660&redirect_uri=http%3A%2F%2Fvls1.iitkgp.ernet.in%2Fvls_web%2FFacebook_Twitter_Login%2Flogin-facebook.php&state=2e1fe22226096b629f7ab37f93796e6f&scope=email#_=_ has resulted in too many redirects. Clearing your cookies for this site or allowing third-party cookies may fix the problem. If not, it is possibly a server configuration issue and not a problem with your computer. Warning: include(../db.php) [function.include]: failed to open stream: No such file or directory in /home/onlyimg/public_html/facebook/test/offline_access/fblogin.php on line 4 why???????????? Facebook is never safe.However i liked this info. i cant retrieve user's friend list ... Is it SDK version problem ?? Now it will write to the database...but still needs a lot of work..like the redirects and why it keeps writing to the database..and doesn't show the profile_pic which is what most people would want over any of this.. but nevertheless it is a good idea. You are using session variables in home.php to remember the data. This can be done by adding -include("fblogin.php") in home.php. Then u do nit hav eto store variables in $_SESSION. Am I correct or will there be any problem ? Can you please post an updated version of this code for download? The current code does not work properly according to the tutorial. whats the wrong over here??? I was just implementing this script, but getting an error message as follows..
An error occurred. Please try again later." before you sign in is this possible to add sign up option in this demo? please help . Hey bro....it's very best script to get the data of FB users...but when m trying to upload this into Fb app m getting page isn't redirecting...gimme a solution.....thanx.. I have read that offline_message will be deprecated as that the PUBLISH_STREAM will be used instead. But when I tried again to use this scope, the same happens that no message is posted on the wall if the user is offline. I created an app which uses users basic information..Now i want to get access to users advanced information..Is it possible and how? Its a good blog, every piece of code is working very well... But I got one doubt. I've placed a logout link that I got using "$facebook->getLogoutUrl();" in "home.php". Once I click it, I am logged out of fb. But my application is once again redirecting to "home.php", but I want it to be redirected to "logout.php" How am I supposed to do this? [email protected] is my mail-id. Trying to search for friends by using search box in app ,instead of strolling through them, but keep getting error message 102 requires users session thrown in. Familiar with this error message? I am new to facebook development. I have a question. Can I save the facebook friend list that I get for a particular user in session. Considering there could be hundreds of friends. if no what is the right place to save friend list. please create table use script ..
Hey, am getting this error Given URL is not allowed by the Application configuration. : One or more of the given URLs is not allowed by the App's settings. It must match the Website URL or Canvas URL, or the domain must be a subdomain of one of the App's domains....... Whats going wrong? how to send app message daily on friends wall like daily horoscope in php pls help !!!!! hello i cant print my data on my page after login success so what can i do? what if after i click on login button then it update on my wall say ' Hi ' automatic. Thanks for this script, now I want to access friends info using this script, i was trying through https://graph.facebook.com/me/friends but i am not able to implement it perfectly so please help me..
what the script to get Access Token ? Would you help me Guy. The following permissions have not been approved for use and are not being shown to people using your app: user_birthday, user_about_me and user_activities. I have the same issue, have you resolved this issue. Please tell it's working fine but i don't understand facebook owner have yet not given permission for me.Please let me know how to do this ?Thanks in advance. Basically your demo's echo no data? Has Facebook removed the nice looking request? How to show User_About_Me? Error_log showing : CSRF state token does not match one provided.